This section describes how Mayavi can be used as a scientific data visualization and 3D plotting tool in interactive application. 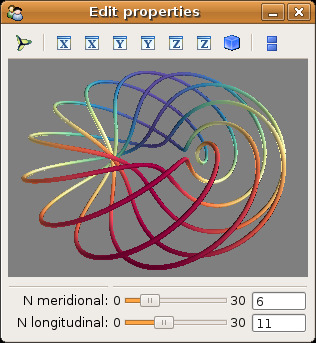 Mayavi can be used as a fully integrated and interactive 3D plotting tool in a GUI application. Using the event model behind Traits and TVTK, all the different properties of a visualization can be changed dynamically, including the data visualized itself. In this section, we first show how an interactive dialog embedding a Mayavi scene can be built, using Traits . Then we show how to integrate this dialog in a WxPython or a PyQt (or PySide) application. Mayavi and TVTK are entirely built using the Traits library which provides easy callbacks and visualization for objects attribute. All the different properties of the pipeline and pipeline objects are expressed as Traits, i.e. special attributes that can be visualized in dialogs and that fire callbacks when they are modified. In particular this means that when a visualization object is modified, the scene can update automatically. We strongly suggest that you refer to the Traits documentation for more details. There are also a list of introductory materials <https://support.enthought.com/hc/en-us/articles/204469620-Introductory-materials-for-Traits-and-Traits-UI> for learning Traits and Traits UI. To build a custom dialog with a Mayavi scene, the best option is to create a class deriving from the base Traits class. A special attribute, called SceneModel can be used as an attribute to represent a Mayavi scene that can accept objects. This defines the model , i.e. the main HasTraits object in which the application logics is contained. The Mayavi traits ui example is a fairly comprehensive example that demonstrates how you can embed almost the entire Mayavi UI into your traits based UI. An object representing a scene is interesting only if you can visualize data with the scene. For this we can instanciate an Engine and assign it to the scene. Having an Engine only for one scene allows us to confine action and visualization objects only to this scene. We can also use an MlabSceneModel instance, rather than a SceneModel , imported from mayavi.tools.mlab_scene_model . This scene model registers the figure in mlab (mlab: Python scripting for 3D plotting). It has an embedded mlab attribute, that exposes the mlab commands (see 3D Plotting functions for numpy arrays). For instance plotting 3D points can be achieved with self.scene.mlab.points3d(x, y, z, s) . When using several ‘MlabSceneModel’ in an application, there is an ambiguity regarding which scene mlab should use to plot to. This is why relying on using the current figure, as mlab most often does, is dangerous. However, this functionality is new in Mayavi 3.2.1. A full example with two embedded scenes is given on Multiple mlab scene models example. Having an interactive application is interesting only if you can do custom, domain-specific, interaction with the visualization. A complete, runnable, code based on the above comments is given in the Mlab interactive dialog example. The Lorenz ui example shows a good example of this situation. Lorenz ui example: A didactic and simple example that shows how the lorenz model can be integrated and visualized interactively while changing the model parameters. Mayavi traits ui example: An example showing how you can mimic the UI of the Mayavi application with simple code using Traits. Multiple engines example: An example showing how you can isolate different scenes by affecting them to different engines. Coil design application example: A full-blown and elaborate application enabling specification of a current-loop description for a coil, and integration of the resulting magnetic field with real-time visualization of the field and the coil structure. Wx embedding example: a simple example, as above. Wx mayavi embed in notebook example: a more complexe example, showing 2 different Mayavi views embedded in a Wx notebook. Mayavi dialogs can also be integrated in a PyQt or PySide application. For a full-blown example of embedding in Qt, see Qt embedding example. Your Traits application will not work.